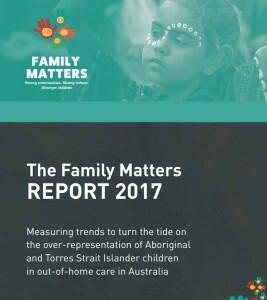 Family Matters Report 2017: Calls for urgent action on the unacceptable rate at which Aboriginal and Torres Strait Islander children are being removed. The rate at which Aboriginal and Torres Strait Islander children are removed from their families is an escalating national crisis. Without immediate action from all levels of government further generations of children will be lost to their families, cultures and communities, according to a new report from the Family Matters campaign. The report – launched at Parliament House on 29 November – reveals a shocking trend in the removal of Aboriginal and Torres Strait Islander children, who are now nearly 10 times as likely to be removed from their family as non-Indigenous children – a disparity which continues to grow. If we continue on this path, carved out by the flawed approaches of consecutive governments, the number of Aboriginal and Torres Strait Islander children in out-of-home care will more than triple in the next 20 years. “Twenty years ago, the Bringing them Home report brought public and political awareness to the destructive impact of the Stolen Generations on communities, families and children – a historical pain that has caused trauma with lasting impacts. We cannot allow the history of trauma to devastate yet another generation of our children. The Family Matters Report clearly shows we have a system that invests in failure and not success. The Family Matters Report provides a comprehensive analysis of child protections systems in every state and territory, judged against a series of building blocks to ensuring child safety and wellbeing.